In many ways, the switch to 2XU reflects the evolution of our Club. As we demand more from our playing group, it is important we support them with the most technically advanced high performance apparel available. The Gold Coast SUNS are pleased to announce 2XU, the country’s leading high performance sports apparel brand, as the Clubs new official apparel partner. The powerful new relationship will not only offer all Gold Coast SUNS players the benefits of a highly technical, custom-designed Club Uniform, but access to 2XU’s highly acclaimed compression garments for the Club’s high performance needs. Travis Auld, GC SUNS CEO, is thrilled with the new alliance and the significance it holds for the Club ahead of the 2013 AFL Premiership Season. “We are really looking forward to working closely with 2XU." “In many ways, the switch to 2XU reflects the evolution of our Club. As we demand more from our playing group, it is important we support them with the most technically advanced high performance apparel available,” said Auld. Already the exclusive Official Compression Partner to the Australian Institute of Sport (AIS), 2XU is one of the world’s most revered engineers of performance compression and boasts an enviable list of allies both nationally and internationally. While 2XU has been involved with AFL Clubs for over five years by way of compression, the 2013 Season will mark its Official AFL Apparel debut. Having supplied uniforms to some of Australia’s most prestigious entities including Rowing Australia and the London 2012 Australian Paralympic Team, foray into the AFL was a logical next step for 2XU.“As the highest-level professional competition in the sport of AFL, and the most popular spectator sport in Australia, entry into AFL has been a long time goal for 2XU,” said 2XU Teamwear Division Manager Graeme Clarke. To achieve the GC SUNS desired outcomes, 2XU worked with no less than seven of its finest suppliers to produce the required 23 mandatory units of on-field apparel. Over 30 fabrics have been utilised; almost half of which were developed exclusively for the GC SUNS high performance player, coaching and corporate needs. New GC SUNS High Performance Manager, Stephen Schwerdt identified 2XU’s benefits to the players. “2XU will provide players with the benefits of their highly acclaimed compression garments for training, game day and during recovery sessions to take advantage of an array of physiological benefits; from improved circulation and heightened agility through to reduced muscle fatigue and damage,” said Schwerdt. With a focus on optimising athletic performance in the elite category, where physical demands and stakes are high, 2XU is driven by a goal of equipping athletes to feel more prepared, game-ready and capable than their opponents. The way its players prepare, recover and utilise cutting edge technologies is paramount to the growth and development of Clubs like GC SUNS and 2XU’s industry-leading apparel is sure to aid this process. With a relentless commitment to engineering world-class garments from fabrics which deliver tangible benefits to the wearer, 2XU sets the benchmark in high performance compression. 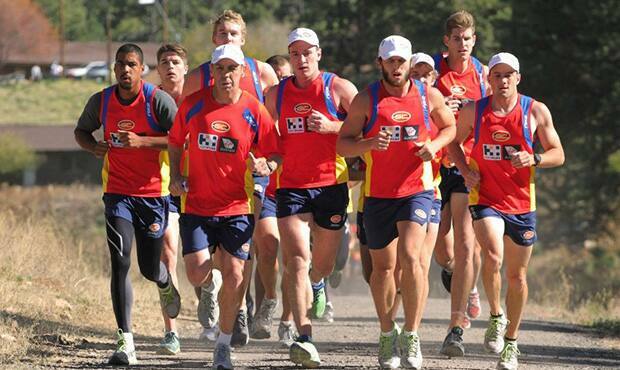 Ongoing testing, research and consultation with professional sporting bodies of such calibre as the AIS and the Gold Coast SUNS, is integral to the brand’s winning formula. GC SUNS players have this morning donned 2XU as they fly out to Arizona to complete the teams training camp in Flagstaff. 2XU ("Two Times You") was launched in January 2005, and is driven by a relentless company mission to advance human performance through the development of world-leading athletic garments. In its first year, 2XU graced the skin of multiple World Champion athletes and has since formed powerful alliances and key partnerships with World Champions across the globe in numerous sports including Triathlon, Cycling, Swimming, Netball, AFL, Soccer, NRL, NFL and Running. 2XU is also the exclusive Official Compression Supplier to the Australian Institute of Sport. Founded and based in Melbourne, Australia; 2XU is fast becoming the most technical sports brand in the world. Designed and tested in consultation with industry experts, all garments employ intelligent physiological design, cutting edge performance fabrics and construction. The premium Australian brand is now stocked in multiple countries around the world.